The black bowler hat is quintessential to dressing like Run-DMC. While hip-hop musicians have long made an impression on clothing trends, some artists have created styles that make them stand out as fashion icons. Run-DMC is such an act. The rap trio was so inspired by their signature Adidas sneakers that they wrote a song about them. In fact, "My Adidas" led to an endorsement deal, the first ever between hip-hop artists and a major corporation. Of course, dressing like Run-DMC requires more than just name-brand athletic shoes. Wear a basic black shirt, pants and jacket. In their heyday, the members of Run-DMC typically wore either black jeans and black jackets, black tracksuits, or coordinating black leather pants and jackets, all worn over a dark T-shirt. The Run-DMC, Adidas or other iconic logo is optional. Pull on the signature Adidas Superstars -- the classic shell-toe basketball sneakers. Run-DMC members Run (Joseph Simmons), D.M.C. (Darryl McDaniels) and Jam Master Jay (Jason Mizell) wore theirs without laces. The attention they brought to the Adidas brand was rewarded with a major endorsement deal with the corporation. In fact, they made the shoes so popular, you may even be able to find a knock-off brand that provides a similar look. Accessorize with a chunky gold chain, very popular in the 1980s. Run-DMC was one of the hip-hop acts that made them fashionable during the years they were cranking out hits such as "My Adidas," "It's Tricky" and "Walk This Way," a collaboration the trio did with rock band Aerosmith. Don't go overboard like Mr. T -- a single thick gold chain will do. 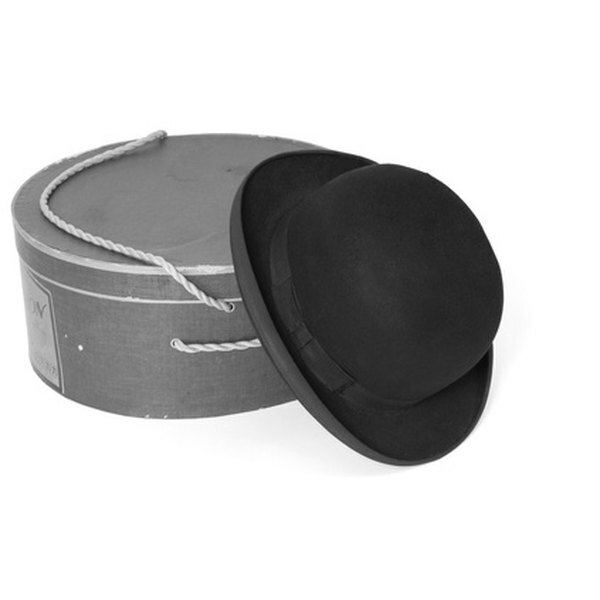 Top off the look with a black bowler hat or fedora, another signature item that the band was rarely seen without. Enlist a few friends and dress alike. A trio dressed in Run-DMC garb will be much more recognizable than just one person. Accessorize with a pair of thick-rimmed glasses or sunglasses with black frames, of course. "Run-DMC Recall ‘My Adidas’ Impact, 25 Years Later"
Anne Shelton is a writer and editor living in Columbia, S.C. She honed her skills doing corporate communications and marketing in the health-care, insurance, manufacturing and business fields. She now enjoys writing about an even wider array of topics. Shelton earned her Bachelor of Arts in English from Louisiana State University. How Do I Find a Goth Guy to Date? What is an Oyster Perpetual?